As the wind howled round the house on Saturday evening perhaps not the most obvious choice for a run the following day was a forest, but having enjoyed the recent night orienteering event in Durham City I was tempted to give it another go. Thankfully Camilla needed little persuasion to join me, and on arrival we were welcomed by Dougie who was starting his day by manning the car park. This was my second orienteering event – it is a whole new world of running, but I am happy to report a very friendly, relaxed and supportive one. 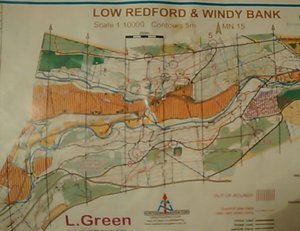 There was a choice of about 7 courses described by colour, I was advised to attempt the light green which is not considered technical in terms of the location of the control points of which there were 12 located around a course of a minimum of 3.5km. We paid our £5 entry, donned our electronic dibbers and set off to the start. Dougie had tipped us off the night before that the control descriptions were on the website so I had had an informative half hour deciphering the arrows, squiggles etc and carefully writing them out to carry with me- the logic being that at least if I knew I was looking for a ‘small depression’ it would be easier to find it when running through the forest. 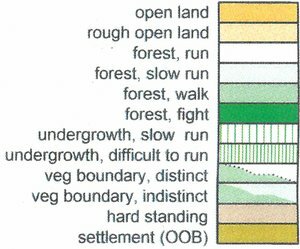 Helpfully the symbols bear little resemblance to the actual geographical features on the ground. It was a good job I had remembered most of it because on arrival at the start I realised that I had lost it. Although the organisers were happy for people to do the event as a pair or small team Camilla and I had decided to tackle the same course but individually, Dougie was manfully going for the brown option (the hardest one). You start at intervals of several minutes- so you can’t follow people, and pick your map up at the point of starting. You have to visit the controls in number order. The controls are helpfully marked on the ground by orange and white flags and are individually numbered so you know when you have excitedly found the wrong one! For me mild panic set in when Camilla (who has done a few of these events) immediately crouched down with her map and compass and set off in the opposite direction to the previous people who were doing our course. A helpful man then offered to talk me through the map – big learning point here, orienteering maps bear very little resemblance to OS maps which I am quite familiar with – as I peered into the dense undergrowth I was a little surprised to see it described on the map as being ‘forest, run’, goodness only knows what ‘forest, fight’ (yes it is an actual thing) looks like. And then I was off, immediately up to my ankles in bog, fighting my way through the trees to arrive at control number 3. Choice words were muttered, doubt set in, and I lost all track of time. Soon I was back on track and I suspect more through luck than skill I was soon systematically finding my way through the controls without need for my compass- although I don’t feel like I did much running. I have always run off road over all sorts of terrain but there are definitely some skills to be developed here. I bumped into Camilla whilst trying to find some ‘thicket’ in the middle of a load of trees, she seemed to be making good progress. All too soon – or perhaps hours later I arrived at the finish, thrilled to have found all my controls in a mind blowing or perhaps truly terrible 45 odd minutes and have no idea how much distance I covered – you have no idea how well you have placed until full results are out due to the staggered starts. Camilla arrived a little later than expected having had a nightmare involving trying to locate a spring and ending up in a marsh. Amazingly I was first in my category – that’s never happened before. I think I might be hooked…..